Kritters Thoughts: Georgia Chambers fled from home 10 years ago for a reason that the reader is left to find out. She is having to return home for work and her work reason will turn very personal. First, I enjoyed this book, I just didn't love it. Rarely do I say this, but I felt as though this story could have been told in fewer pages. There were moments toward the middle where the story just kind of puttered and I wanted some action to take place to move things forward. The second half really picked up once the reader was made aware of all the secrets and the characters were learnings things too, but with the slowness of the middle I just couldn't completely love this one. This is actually my first Karen White read and I own a few of her previous and I am definitely intrigued to read another to see if I just don't love her pacing or if this book is different from the others. 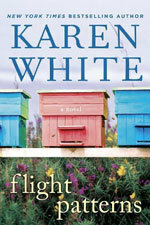 Have you read Karen White? Which is your favorite? Where should I start with her backlist?